This is a guest blog by Tom Maskell, a PhD student in Digital Civics at Newcastle University. Tom’s research looks at how technology can help cyclists collect data and make the case for better conditions for cycling. There is an appeal for participants to take part in a trial of our technology, Spokespeople, at the end of the article. Make yourself a cup of coffee and enjoy the reading! I was well into my twenties before I bought a bike that wasn’t a bmx. I only bought it because one evening in the pub a friend and I decided it would be a good idea to cycle from Rome to Barcelona. If I said that trip was badly planned that would suggest at least some planning went into it. We never got anywhere near Spain, and part way through we decided to cycle home instead. Apart from being one of the best things I have ever done, and an education in how to eat several thousand calories on a tight budget (mainly eggs and bananas if you’re interested), that trip showed me how easy it is to travel long distances on a bike with surprisingly little effort. Back home, I came to see my bike as something functional, a practical way to get around for trips that were too far to walk. It freed time and often made more sense than the car. It was fun to ride, but it definitely wasn’t for sport. I only found out the other day that the Dutch have a separate names for everyday cyclists – fietser and sport cyclists wielrenner (literally wheel runner). That distinction is probably not new to many of you reading this, but it made me wonder how different people’s perceptions of cycling might be if we had two words for cycling in this country. Or even better, what if the word cyclist conjured an image of someone just trying to get to the shops or pick up their kids rather than racing in a peloton? Several years after that first cycling trip, I got a job at Sustrans where I spent four years doing a number of jobs from adding up the numbers for our monitoring, to delivering “stabiliser free” sessions in schools, and eventually trying (and mostly failing) to find new partners and win us work. Along the way, I got interested in how technology might help us to promote cycling. I managed to convince people at Sustrans to let me create a system that used mobile phones and a website to help participants on our health related projects to track if, and by how much, their walking and cycling levels had increased following our work with them. To me it seemed obvious that technology could answer this question more accurately than people could through their recollections. Some people took a fair bit of convincing though, and pretty much everyone probably got bored of hearing me harp on about technology over the next year or two. When a chance came to study for a PhD at Newcastle University in a department called Digital Civics, a branch of Computing Science that is interested in how technology is used in society rather than the lab, it seemed a like a good opportunity to explore technology’s role in promoting walking and cycling. I’ve now got three years ahead of me, working in a well-resourced department, with a team of developers and other colleagues who can help me to put my ideas into practice. The question I started out with was something like how can digital technology help us to improve conditions for cyclists and by extension to get more people cycling? If you’ve just answered in your head something like “it can’t really, what we need is more and better cycle routes!” then I think that’s not unreasonable. I have some sympathy with the view that at its worst technology has the potential to be a distraction from a clear need to improve our cycling infrastructure. I also agree that infrastructure is the most important thing (although not the only thing) we need in order to increase cycling levels. But how we get there is another question. How can we get to the point where it seems possible or inevitable for the people who make the decisions to build the infrastructure that we think is necessary? I agree with John Adams that we need change to “take root in people’s minds” (pages 10 – 22) before we can see the changes we need, on the scale we need, on our streets. And I think that technology might have a role here in providing a mechanism for us all to collect the data that can help us to make that case for change both to those who make the decisions and the wider public. So, that’s what my PhD is about. Our first attempt at putting this into action has been to develop a technology called Spokespeople. Apart from being a pretty awful pun, it’s essentially a way for people who cycle to broadcast their everyday experiences on the bike. 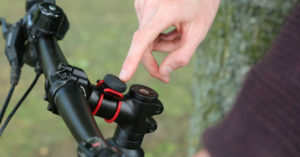 The system involves a Bluetooth button on your bike stem or handlebars and a companion app (currently android only) on a smartphone. Pressing the button records the time and location of the incident. You click once to add more details in the app later, or click twice to launch the app and tell us about your experience straight away by recording audio. The information that you provide will be mapped on the spokespeople.uk website where other people can see your comments and add their own thoughts. The aim is to start a series of conversations about cycling that are tied to everyday experiences on the bike. You might for instance want to record a near miss, or a feeling that where you are cycling is not safe. Perhaps you want to flag up something inconvenient such as a missing drop kerb or bollards that are too close together. You might just want to share a good cycle route or experience. Spokespeople is a platform that aims to make any of those things easy. Just press the button when something happens then tell us a bit more about it in the app when you get time. The app can also be used without the button, but our feeling is that the button is important. It makes it easier to take action at the time when an experience takes place and you care about it most. The button also acts as a visual reminder that you can do something about it. The Give a beep campaign in London has shown that this method can help to gather a lot of responses (compare the level of use to MySociety’s Collideoscope which relies on a website alone for reporting near misses and accidents). And I believe we can take the concept further than these websites have, gathering richer data about what it’s like to cycle in Newcastle and beyond and using it to help us to advocate for change. We’re still in the early stages of developing the technology. So far we’ve got a basic website and a prototype mobile phone app for Android phones only. We are running a two week trial this summer to test the system. We want to understand what people think about the technology, to iron out the inevitable bugs and find out whether it has the potential to be a genuinely useful tool. We are looking for 50 people to take part. The date will be confirmed soon, (keep an eye on the spokespeople website) and will take place during July / August. To take part you need to be a regular cyclist in Newcastle and to have an Android phone. If you do want to take part then please just complete the sign up form here (you can also access it on our website spokespeople.co.uk/about). We will then be in touch to send you a Bluetooth button and bike mount and get you started. The big question for me is what’s next after we’ve collected this data? How can we use it to make the case for space for cycling? That’s something that is still open to debate. I have my own ideas but following the trial we’ll be running a workshop to try and explore these issues and to find out what other interested people think. We want to bring people together to explore two questions. Firstly, what does all this data that we’ve collected mean? And secondly how can we use it to push for change? If it takes me a little while to get back to you it’s probably because we’re expecting a baby any day now… I’ll email back once I’ve had enough sleep to make a sensible reply. Many thanks to everyone at NewCycling for giving me space to outline my ideas and for helping to get the word out about Spokespeople.